New York State has a little more than 700 acres of blueberries in production yielding about 2 million pounds of blueberries annually making it the 9th most important blueberry production state in the nation. Increased consumer interest in dark colored fruit containing high amounts of healthful antioxidants has resulted in many more acres being planted over the past several years. This is despite the soil pH requirement of 4.5 that blueberries, a member of the acid-loving Ericaceae family require. It takes nearly 8 years for blueberries to reach their mature production, but a well maintained planting can remain economically viable for up to 40 years or more yielding in excess of 10,000 lbs/acre. Ninety-five percent of this production is hand-picked and sold as fresh fruit with the remaining 5% going to value added products. Highbush blueberries are grown throughout the majority of the state, but in northern NY and the Adirondacks, cultivars that are crosses between the Maine low-bush and northern high-bush blueberries result in a smaller bush that is much more winter hardy. The threat from late spring frosts remains a challenge to blueberry growers throughout the state. 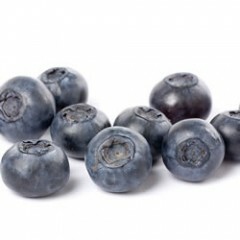 Blueberries have a relatively small pest complex making it a favorite berry for organic production. For more information about blueberry production, visit the Cornell Berry website. Cranberry Fruitworms - a significant pest in blueberries. Fruitworms overwinter as larvae and pupate in the spring, emerging as adult moths after the start of bloom and usually before early fruit set. Moths move into blueberry plantings when fruit is small and lay eggs directly on the fruit. The larvae hatch and tunnel into the fruit and begin feeding. Find out how to control these pests here! Anthracnose is a serious pre- and post-harvest fruit rot in most blueberry growing regions. The flowers are infected early in the spring. The fruit rot appears on ripe fruit with orange spore masses. Find out how to manage this disease here.